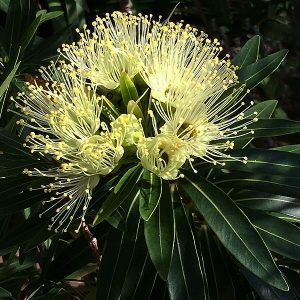 Xanthostemon are a group of trees mainly from Queensland, and the Golden penda, or Xanthostemon chrysanthus is the most widely grown species, and the most readily available for sale. Growing in coastal rainforest areas from sub tropical to tropical Queensland the genus extends through a number of South Pacific Islands. Over a dozen species are found in Australia, they are perhaps one of the most under used Australian Native Plants. These are evergreen trees that require a humus rich moist soil to thrive, depending on species they can reach 20m in height, however usually less than half this in cultivation. Used as a feature tree, street tree or pruned to use as a hedging plant. When in flower it attracts bees, butterflies and nectar seeking birds to the garden. This is a plant tat can be grown in a container if desired, and it will cope with low light situations as long as it has adequate moisture and warmth. Generally the Golden Pends responds well to pruning which makes it possible to keep this attractive tree as a smaller specimen. The best time to prune is after flowering. From seed, which can be slow to germinate. Also by semi hard wood cuttings, which is the preferred method. Soil – Well drained humus rich and moist. Spread – Will form a crown to 8 metres plus..
Foliage – Large glossy deep green elliptical leaves. Flowers – Yellow flowers in large trusses. Flowering Time – Winter to Autumn depending on climate. Species such as Xanthostemon chrysanthus (Golden Penda) are just finding the way onto the market. However Xanthostemon species do include a range of small to medium trees that produce colorful clusters of flowers have nice glossy foliage and make a great feature or specimen tree. X. verticillatus is a smaller growing species with cream flowers. X. oppositifolius – This is the ‘Southern Penda’ more cold tolerant than most.